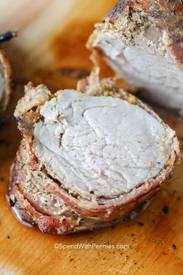 Bacon Wrapped Pork Tenderloin is such an easy meal to prepare and serve! This pork tenderloin recipe from Spend With Pennies is wrapped with Bacon slices and baked, or grilled, to perfection! Pork tenderloin is a tender cut of meat to begin with, but the addition of Bacon really adds to the tenderness and flavor! By slicing the meat into medallions to serve, there is a little bit of Bacon in every bite! Really, Bacon wrapped anything is always a good idea!